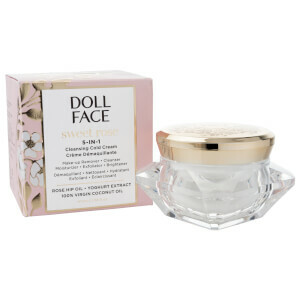 Doll Face is skincare inspired by retro hollywood - the style and the old school glamour. Because skincare doesn't have to be all medicine and problems - it can be beautiful and glamorous. This is reflected in the stunning Doll Face packaging which is made from recyclable materials and fair trade ingredients when possible. Doll Face is imaginative skincare, the Doll Face team go beyond the obvious to create skincare that deliver only the newest solutions for skin. Clever combinations of active ingredients provide maximum skin benefits as well as multiple benefits from each product - because who doesn't love a multi-tasker? Loaded with skin friendly ingredients like vitamins and enzymes and WITHOUT nasties such as Parabens, Pthalates, Propylene Glycol, Mineral Oil, PABA, Paraffin, DEA, Triclosan, Petrolatum, animal-derived ingredients, harmful dyes or fragrances. Tested on starlets, not animals.